When evil bull, Kai (J.K. Simmons), returns from the spirit world and threatens to steal the lives and powers of all of the kung fu masters in the land, it falls to dragon warrior, Po (Jack Black), to save the day. Po needs to learn about and access his panda chi in order to stand any chance of defeating Kai. And who better to teach him than his long lost father? Li (Bryan Cranston) takes Po to the secret land of pandas and encourages him to find his true self. Is this new community the key to Po’s kung fu destiny? When I heard that Dreamworks was going to make a third Kung Fu Panda movie, I began to worry. I really enjoyed the previous two films and just didn’t want the studio to flog the brand to death (I'm looking at you, Ice Age). Despite a promising trailer, my expectations were still low when I entered the cinema to watch Kung Fu Panda 3. How lovely then to find myself thoroughly enjoying this movie. Much of the reason for my enjoyment lies at the door of one Mr Jack Black. His vocal performance as Po is wonderful. This character is just so endearing. I dare anyone not to be swept up in his exciting and often poignant adventure. Of course, Dreamworks has always aced the casting of these movies. You couldn’t really ask for better quality actors than Dustin Hoffman (Master Shifu), J.K. Simmons, Bryan Cranston, Angelina Jolie (Tigress), Seth Rogen (Mantis) and Jackie Chan (Monkey). 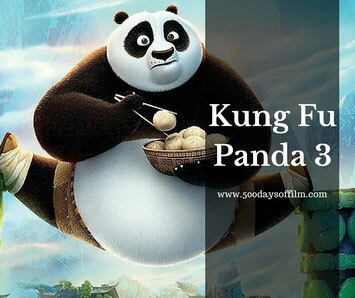 In addition to its impressive cast, Kung Fu Panda 3 has a script that is funny for adults and kids alike and action that keeps little ones well entertained. It has a simple plot (easy for young cineastes to follow) and a warm and fuzzy message: always be the best you that you can be (ahhh). I also loved the animation. It is simply stunning and always inventive. And then I remembered that the film was produced and guided by the cinematic visual genius that is Guillermo del Toro. Ah, no wonder it all looks so good! Kung Fu Panda 3 sounds really good too. There is impressive pedigree here too in the form of the legendary Hans Zimmer. Zimmer is well used to creating the score for animated films - he is responsible for The Lion King, Rango and Madagascar. Here he creates a powerful score by combining a traditional Chinese sound with the obligatory strains of Kung Fu Fighting. Kung Fu Panda 3 is a surprisingly enjoyable and consistently funny family movie with an impressive voice cast and stunning animation - and a worthy addition to the series. Have you seen Kung Fu Panda? If so, what did you think about this movie?